Vale Avenue Motor Works, Guernsey, 1934. Homepage. This page: An invoice describing work done to a pre-war Ford motor-car by this Guernsey-based garage. Mr F.G. Underdown, motor engineer. 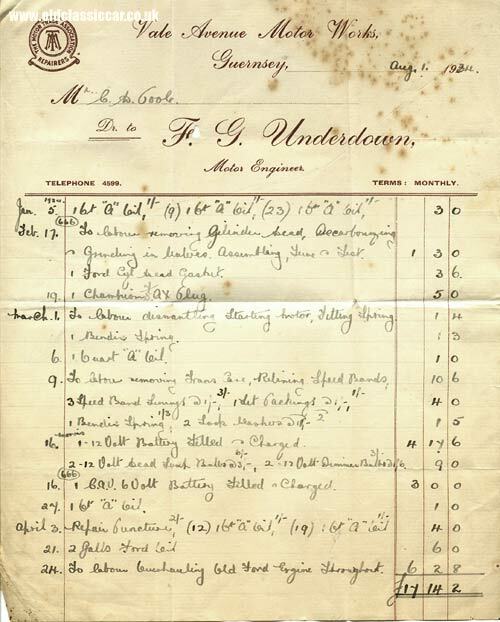 Dating to August 1934, this invoice issued by F.G. Underdown of the Vale Avenue Motor Works, describes work done over a period of months to a pre-war Ford motor-car. The firm was a member of The Motor Trade Association but, despite a phone number being given, no precise details of the garage's address are mentioned sadly. Other items featured in this section, also relating to early garage services on Guernsey, include an illustrated invoice from 1938 issued by Le Lacheur's, a dealer in Chrysler, Dodge and Chevrolet vehicles, and also this petrol receipt issued by Robilliard & Son in the early 1960s. The invoiced work dates from January 1934 right through to the end of April. The work actually relates to two different vehicles. Early in the year, some engine rectification work on a Ford is described in detail - decarbonizing, grinding in valves, re-assembly and the supply of new gaskets all feature. In March, the starter motor was stripped and overhauled, followed by in-depth work on the car's transmission, requiring, among other things, 3 new speed band linings. A new 12 volt battery was supplied on the 16th March, although above this entry is the word Morris, suggesting that two of Mr Goole's cars were in the workshop, and it was the Morris receiving this new battery. On the same day a new 6 volt C.A.V. battery was also supplied, presumably this went under the Ford's bonnet.